An urban “topography” defined by a multitude of elements: street, pavement, colour, texture, car, height, width. We find that the lenght of the street is in perfect contrast with the variety of functions present here: hotel, bank, office spaces, antiques, supermarket, restaurant, bookshop, living, etc. A very lively environment, with an after hours timetable. Our idea is connected to the context, descifred in different layers: an immediate one, related to the physical space, dimensions, constraints, budget; a near one, about the vicinities, users and complementary functions; a distant one, connected to the craftsmen, their identity, body of work and the course of the product from the maker to the MBQ space. After a close analisys of the space, we observe in the actual retail-configuration: firstly the façade, not valueing it’s potential of becoming a medium between interior and exterior, the lack of “dialogue” with the public space/ crossing and an interior course. The façade can’t be seen entirely by walking on the same side as the store. The interaction with the first limit of the shop must be “articulated”. The interior soffit of the window is plated with mirros – by walking from each direction, the passer sees, in the reflection, bits of the interior. A first step. MBQ becomes a pocket to the street. The project’s strategy focuses the proposal on the main direction of the space. A spatial sequence connects the street with the intrance, the interior rhythm with the coffeeshop, from one end to another. Now, the boutique gains depth. The relation with the exterior is strainghtened by having the same finish on the walls, ceiling and floor; materiality and colour offer a tactile experience. A singular element, freestanding towards the perimeter, organizez the space and redefines its areas. 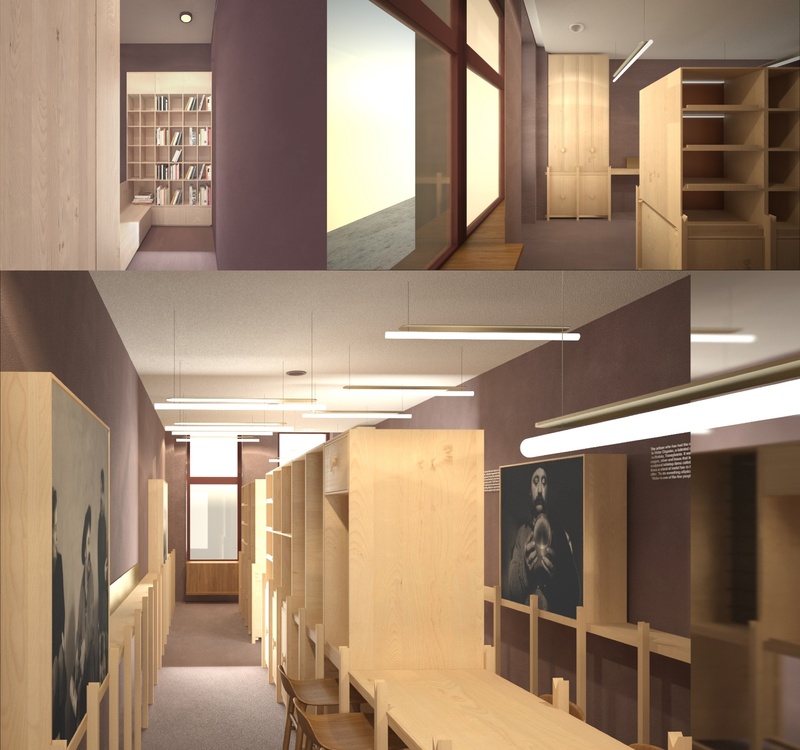 Pathways determined by the acces and windows, trace the exhibiton&information zones into the wall alcoves. The median line forms the retail space. The back-end is to the employees, with a coffee area between. At the same time, we keep in mind that defining MBQ’s activity through the information spots about the craftsmen, body of work and designers, is essential. The project creates a variety of situations that respond to different scenarios of arrangement, a starting point to a new reality for each object. The main retail area is the middle cabinet structure, finished with a long common table, destined for coffee and meetings; part of the same system. The wall alcoves hold the backlit boxes with the designers and craftsmen introductions; the area between are for small accessories retail. The back end of the store is closed off with the espresso machine furniture, doubled left and right by an office and a small bookshop/library. The front of this multifunctional furniture can be used as an projection screen support. The furniture solution embodies two principles: modularity and reversibility. The structure is made out of solid wood, mounted in a simple knot, developed in length with the same distance. Below it holds a quick storage, above, it supports the retail cabinets, by the same dimension. Top modules can be configured by the products size and display method. The positioning reflects an interior functional arrangement of the space, based on the product tipology. Their position can be determined by the proportion of a product, diversity of collection, etc. 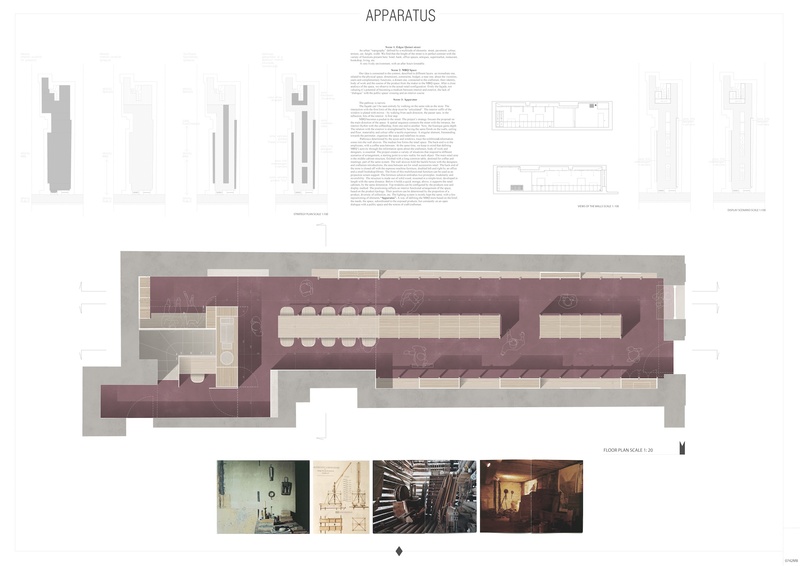 The lighting system is mostly kept the same, with a few repositioning of elements.“Apparatus”. 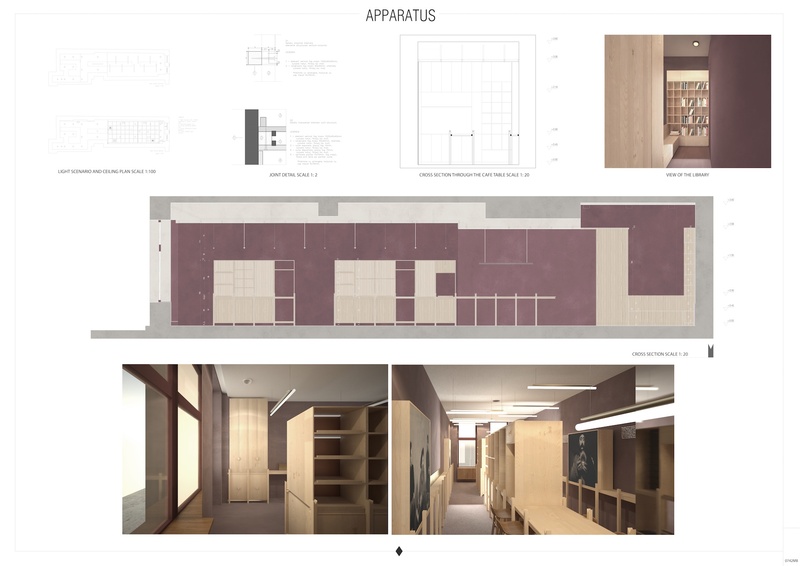 A way of defining the MBQ store based on the brief, the needs, the space, subordinated to the exposed products, but constantly on an open dialogue with a public space and the notion of craft/craftsmen.